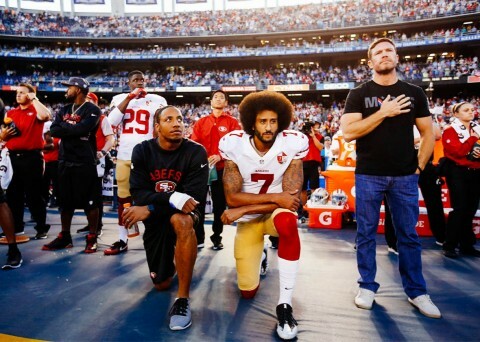 NFL player, Colin Kaepernick, is protesting the systematic mistreatment of minorities in the United States . In a New York Magazine article, the quarterback said “I am not going to stand up to show pride in a flag for a country that oppresses black people and people of color.” He said, “to me this is bigger than football and it would be selfish on my part to look the other way. There are bodies in the street and people getting paid leave and getting away with murder.” His comment is a direct reference to the questionable leniency of police officers in the wake of officer-involved shootings. Whatever one may think about it, the protest is legitimate. The protest is personal. The protest is consistent with the ideals of the country. The protest comes with a promise by Mr. Kaepernick to give $1,000,000 to do something about what he is protesting. Unpaid Labor wrote recently to thank Michael Jordan for making a contribution like that to two organizations. Those organizations are working on the issues surrounding police shootings of black men. So far we don’t know what organizations Colin Kaepernick plans to give money to. Whatever they may be, we hope that other millionaire athletes joining the struggle will put their money where their mouths are. It is predictable that other high profile athletes would “sit down” to make statements in support of Colin’s position. It is predictable that other high profile athletes would “stand up” to make statements opposing Colin’s position. It is also predictable that other high profile athletes would sit down to make statements about their favorite “rights” cause even though they have nothing to do with black people. What is more interesting is to observe that all kinds of “rights protesters” always seem to compare their cause with the cause of Civil Rights for black people. And why might that be? Perhaps it’s because no other group in the history of our nation defines what it means to be deprived of Civil Rights like black people. Perhaps it is because no other group in the history of our nation made an indispensable contribution to the nation while being denied those rights. Nothing compares with this great paradox. In 1860, the value of enslaved Americans of African descent was estimated at $3 Billion—yes with a “B”. That category was second only to land value in the United States. The contributions of this Unpaid Labor help make this country into the world power it is today. Nothing compares with twelve million and five hundred thousand enslaved people working for their entire lifetimes. Nothing compares with them working over the course of two and one half centuries. Nothing compares with those people also being the indispensable factor in the United States becoming the most successful in nation in modern history. So, Colin Kaepernick has got it right and Unpaid Labor hopes that his protest fuels the conversation towards reforming this nation’s mindset. The changed mindset that comes with knowing this history will go a long way toward benefiting everyone. When we know our history we can all stand together.